With a population of over eight million inhabitants Ho Chi Minh City is the largest city in Vietnam. It was named Saigon by the French after they invaded and conquered Vietnam’s southern provinces in 1859. Following the Vietnam War Saigon was renamed Ho Chi Minh City in honor of North Vietnam’s first president. The city is still referred to by many as Saigon, particularly district 1; the tourism hub. This large and modern city can be accessed by bus, train, and both international and domestic flights. With its large and modern airport (SGN), it is on most travelers’ itineraries and is certainly worth visiting for a few days. 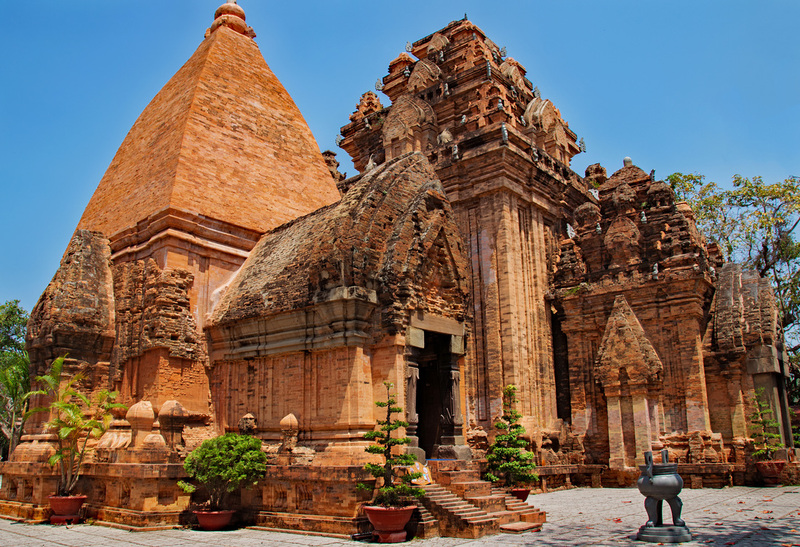 The city has a number of historic buildings and museums, many of which are in easy walking distance from the Bến Thành market area where many budget hotels are located. ​One of the most visited sites in the city is the iconic Independence Palace, also known as Reunification Palace. The current building’s construction was started by South Vietnam’s president Ngô Đình Diệm in 1962 after a failed coup attempt badly damaged the original French-built Palais Norodom. 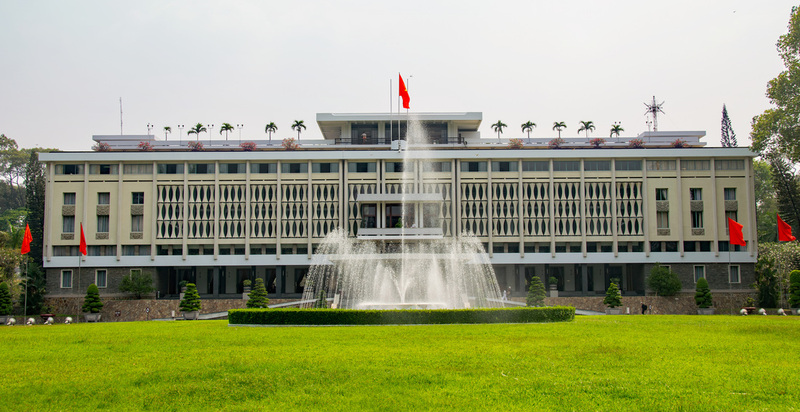 Independence Palace was designed by the highly acclaimed Vietnamese architect Ngô Viết Thụ, whose goal was to create a building which combined both Eastern and Western styles. Completed in 1966, the Palace would serve as the headquarters of South Vietnam’s presidents until the fall of Saigon on April 30 1975. Renamed Reunification Palace shortly after the end of the war, it appears that the building and most of its furnishings have remained unchanged since it was occupied by South Vietnam’s last president. The building is a time capsule of sorts; its contents could fill a museum of 1960’s art and design. Relics from the war include a HU-1 helicopter, a gift to the former president from the US government and two Soviet-built tanks like the ones that crashed through the palace gates in 1975, effectively ending the war. The building’s basement is one of the most intriguing areas of the Palace. Constructed with thick concrete walls as a bomb-proof bunker, the “war room” contains many maps that the president and his generals once used to plan the battles against the North Vietnamese. Located throughout the bunker complex are massive amounts of American-made radio equipment which not only connected the president to the various battle fields but also to Washington D.C. Judging from the many offices and numerous telephones it’s likely that a very large staff must have been needed to run this operation. One of the great things about Vietnam is the admission prices to enter museums and historical sites. An adult ticket to the Palace is 30,000 VND, roughly $1.30 at the current exchange rate. Vietnam is one of the most economical countries to visit in Southeast Asia and has plenty of things to do and see. Situated in the rolling hills of Vietnam’s central highlands, Da Lat’s cool temperature and stunning views offer the perfect weekend escape for Vietnamese city dwellers. Located 190 miles (306 km) north of Ho Chi Minh City, it is firmly on the well-tread traveler’s route through the country. Easily reached by bus and with many budget hotels and hostels it is a popular backpacker’s destination. French colonialists were perhaps the first group to recognize the potential that this heavily forested area had as a destination for rest and relaxation. The highlands’ crisp, cool air was thought to have substantial health benefits; development of the former hill station began in the late 1800’s and by 1907 Da Lat’s first hotel was completed. The French continued building until their departure in 1954, adding villas, missions, parks and a golf course. Fortunately, Da Lat was spared the brunt of the Indochina wars and much of the original charming French architecture survived and can still be seen today. Once known as the “Little French Alps”, one of the town’s most note-worthy buildings is its railway station. This art deco style building was completed in 1938 and little appears to have changed since its completion. It should be noted that trains departing this station only travel over four miles (7 km) of track, to the nearby village of Trai Mat. The station and the railway are maintained mostly as a tourist attraction and are indeed worth a visit. Other sites to see in and around Da Lat include the summer palace of Vietnam’s last emperor Boa Dai. Like the Reunification Palace in Ho Chi Minh City (HCMC), the summer palace is another time capsule filled with relics of the 1950’s. Another highly popular attraction is the cable car ride up to Thien Vien Truc Lam Monastery. The cable car ride takes roughly 25 minutes and costs a mere 50,000 VND, or just over $2 USD. This peaceful Zen monastery sits at an elevation of 4,265 feet (1,300 m) and overlooks Benhuit Mountain and Tuyền Lâm Lake. The four-hour bus trip between Da Lat and Nha Trang is well traveled by foreign visitors. The winding drive through the mountains is absolutely breathtaking. A number of companies make this trip daily for as little as $6 USD. Tickets can be purchased through guest houses and hotels in Da Lat. Travelers in Nha Trang can buy tickets from one of the many travel agencies in this tourism hub. Nha Trang is a beach resort town which is especially popular with Russian families and couples. 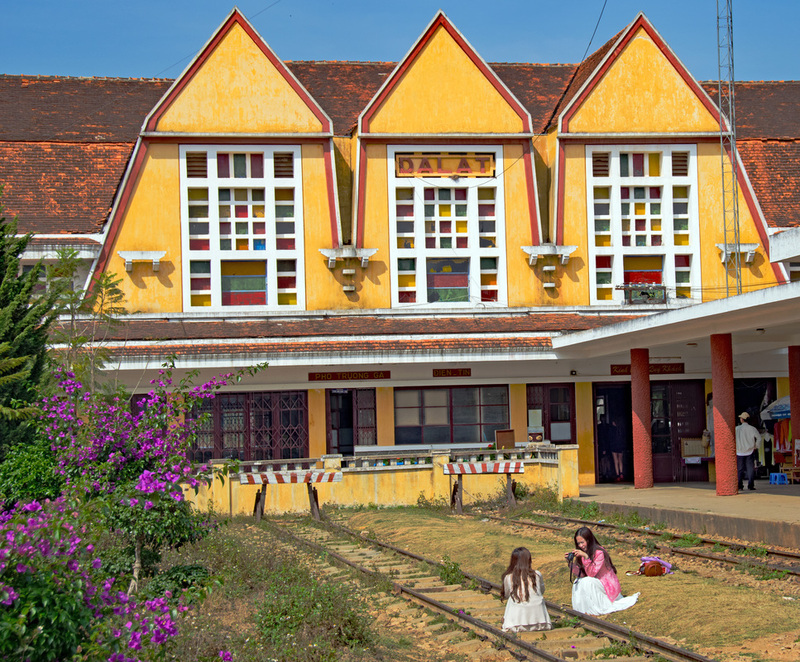 It also attracts its fair share of backpackers and other travelers as Nha Trang Railway station is a busy stop on the line connecting HCMC and Hanoi. It is also considered to be Vietnam’s premier SCUBA diving center. Besides the beach, the city has a number of interesting sites to see which include Long Song Pagoda and the Cham-built Po Nagar temple. Commonly known as Po Nagar Cham Towers, the site had been used as a place of worship by the Cham people starting around 781 AD. 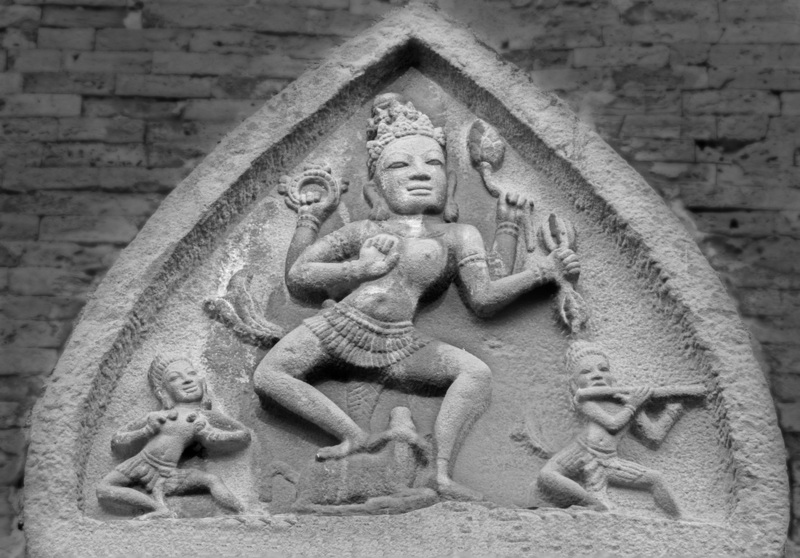 The Cham arrived in central Vietnam from Indonesia sometime in the third to fourth century B.C. The kingdom of Champa would eventually cover a large portion of present day Vietnam. They were contemporaries and rivals of the Khmer until 1203 when they were defeated in battle by King Jayavarman VII. The site once consisted of ten towers constructed between the seventh and twelfth century, of that ten, only four still stand. The remaining towers and monuments have been carefully preserved and reconstructed. Perched on top of Cù Lao Mountain (hill is a more accurate description) the beautiful site feels more like a park than the active place of worship that it is. Every day scores of Vietnamese come to Po Nagar to say prayers and give offerings of incense, candles and flowers. Each one of the towers contains a shrine which is meticulously attended to throughout the day. 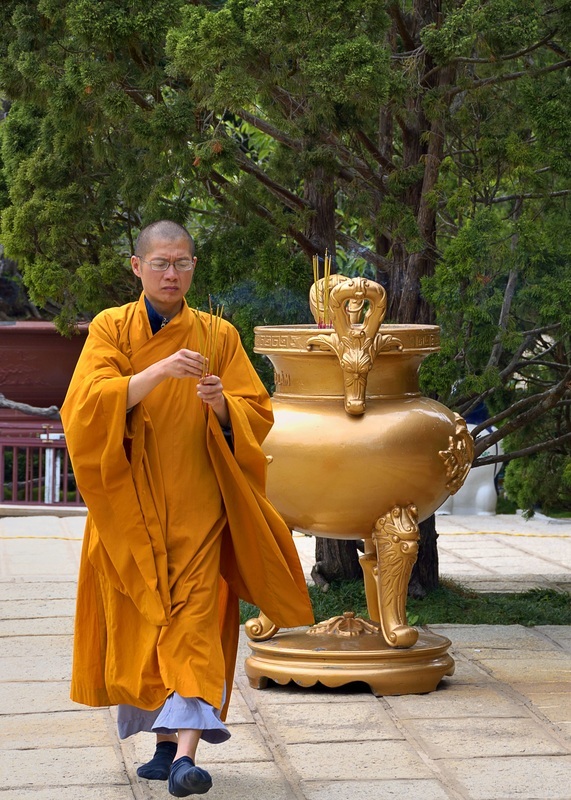 Proper dress, in this case a robe provided by the temple staff, is required to enter the shrines. The site also has a small museum which holds some artifacts and interesting photographs of the towers before reconstruction. Quảng Ngãi is much less visited by foreigners than either Da Lat or Nha Trang. In fact many travelers only stop here as a day trip while traveling the coastline by car. The town is not noted for handicrafts or a night market filled with souvenirs, and is certainly not on the main tourist path. 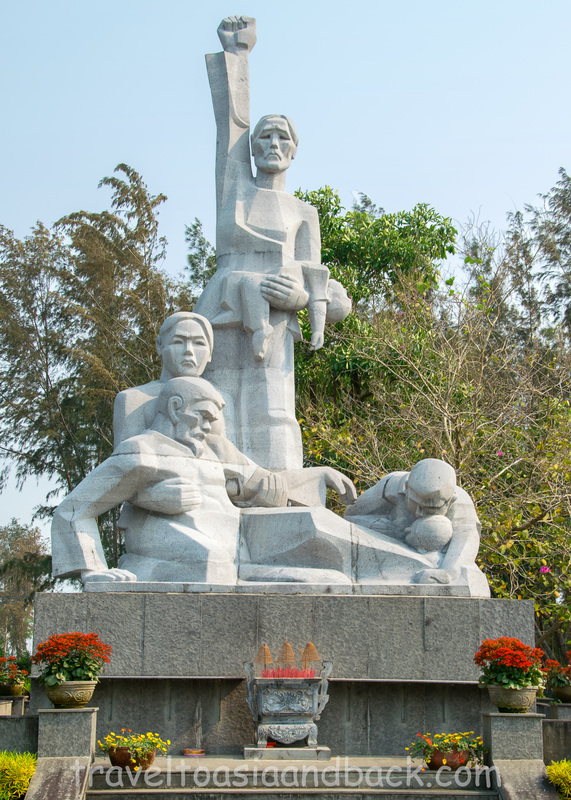 We chose to spend a couple of nights in Quảng Ngãi to break up the train trip between Nha Trang and Da Nang and to visit the Sơn Mỹ Memorial. Located approximately nine miles (15 km) from the center of Quảng Ngãi; Sơn Mỹ was the name of a village that had been subdivided into a number of small hamlets. The most well-known of these were Mỹ Lai and Mỹ Khe. On March 16, 1968 soldiers from the U.S. Army killed 347 to 504 unarmed civilians which included women, children and the elderly. This incident would become known in America as the Mỹ Lai massacre while the Vietnamese refer to it as the Sơn Mỹ massacre. The army attempted to cover up the incident, but when it was leaked to the press in 1969 the American public was outraged. The memorial consists of the original foundations from the victim’s homes, some graves and a museum. The impressions of combat boots and tiny feet can be seen in the concrete pathway between the relics of the former homes and the crude bomb shelters the villagers once cowered in. Sơn Mỹ is a sobering place to say the least. ​A taxi can easily be organized to make the 20-minute trip to Sơn Mỹ. The town’s only other points of interest are the Quảng Ngãi History Museum and My Kye Beach, either of which can be included in a visit to the Sơn Mỹ Memorial.